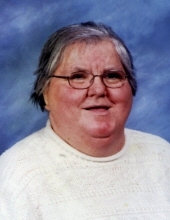 Lois Edna Dove, 65, of Reese, died Monday, February 4, 2019 at McLaren Bay Region in Bay City. She was born July 7, 1952 in Bay City, daughter of the late Vernon and Bertha (Fenner) Dove. She was a proud member of the Gilford United Methodist Church for many years and was a current member of the Vassar United Methodist Church. Lois enjoyed spending time with her family, knitting, and enjoying nature from her swing in the backyard. In her younger years she enjoyed going to the family cabin in St. Helen, riding her bike with her nieces, nephews, and neighborhood kids, and going to see friends at the Personal Independence Center in Caro. Surviving are her three sisters and their spouses; Sara Kay and Dan Dipzinski, Lila Mae and Richard Ruppert, Lou and Larry Collins, nieces and nephews and their spouses; Alicia and Brian Schian, Anne and Art Marquardt, Sandy Dipzinski, Darlene Dipzinski, Donald and Rebecca Jozwiak, Christine and Brad Ferguson, Ted Collins, Laura and Jeff Marion, her brother-in-law, Richard Jozwiak, and many great nieces and nephews. She was preceded in death by her parents, her sisters; Margery Dove and Mary Jeane Jozwiak, her Step Mother Laura (Lane) Dove, and a nephew Dennis Ruppert. Cremation has taken place and a Memorial Service for Lois will take place at 11 a.m. Saturday, February 9, 2019 from the Ware-Smith-Woolever Funeral Home, 9940 Saginaw St. in Reese. Reverend Scott Sherrill of the First United Methodist Church in Vassar will officiate. Lois’ family will receive friends at the funeral home on Saturday from 10 a.m. until the time of the service. Those planning an expression of sympathy are asked to consider the Reese Little League. To plant a tree in memory of Lois Edna Dove, please visit our Tribute Store. "Email Address" would like to share the life celebration of Lois Edna Dove. Click on the "link" to go to share a favorite memory or leave a condolence message for the family.